Jeweled metal case (credit card sized) from Accoutrements has a magnetic interior side to hold needles and a sticky interior side to hold beads. Let us pick the color and jewel for you or call the shop 650-321-3494 to see what we have. This is a must have accessory if you ever bead. Pour beads onto the sticky side and leave them there until you are done with that color area - just close the case when you finish stitching for the day. The magnetic side holds beading and other needles. The sticky side won't take the color off beads! 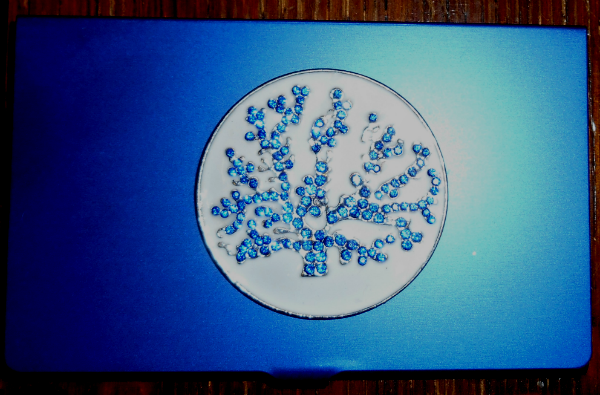 Jeweled metal case (credit card sized) has magnetic interior side and sticky interior side to hold needles and beads.